Taking a break from sharing my Greece experience, I spent this past weekend in the beautiful city of Boston. Remember I told you that you don’t have to go far to travel? This is a great example of just that. Boston is a four hour drive from my home. We left after work on Friday and came back home Sunday evening. We packed the weekend full of all the major tourist spots and museums. It’s easy to be a Weekend Warrior, just look for cool attractions near you, even if it’s just a new restaurant or hiking a gorgeous trail. Our first stop Saturday morning was the Sam Adams Brewery. Who doesn’t love beer at 10am? I know I do! 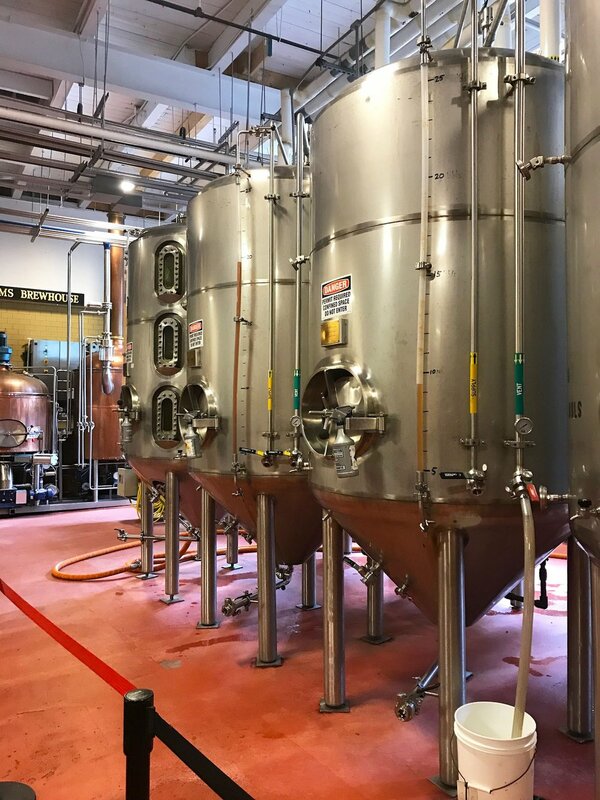 Sam Adams Brewery offers tours every day 6 days a week. The tours are first come, first serve so they recommend getting to the brewery early, especially on Saturdays. So that’s just what we did. We hopped on the second tour of the morning. We learned the history of the Sam Adams brand, the beer brewing experience, and sampled three of their beers. Our tour guide, Jack, was hilarious and Dan (Dan the man!) handled our large group wonderfully. The tour is free but beware the gift shop! Like any good tourist attraction, you’re dumped into a gift shop after the tour. They fill the gift shop with special, limited edition brews that you’re bound to be enticed to purchase. I ended up purchasing the Raspberry Lemon Gose and I couldn’t be happier with it! After our brewery tour, we headed towards our lunch destination, the original Cheers restaurant that inspired the TV show. We decided to explore Boston Common on our way to the restaurant. As it would happen, the counter protest reported nationally was occurring that day. With everything going on in our country, we felt is was important to join in for a few minutes and support the rally. It was humbling to stand amongst the counter protesters standing for equality and love. Go Boston! Finally we made it to Boston’s #1 tourist trap (in my opinion), Cheers. I am sad to report that no one knew our name. Our overall experience, however, was positive; better than I was even expecting. Most tourist trap restaurants end up serving mediocre food knowing they can get away with it. Both our meals were great and we tried the Sam Adams Boston Brick Red beer, a Sam Adams brew that can only be found in the city of Boston. After Cheers-ing at Cheers, we walked through the Boston Public Garden. 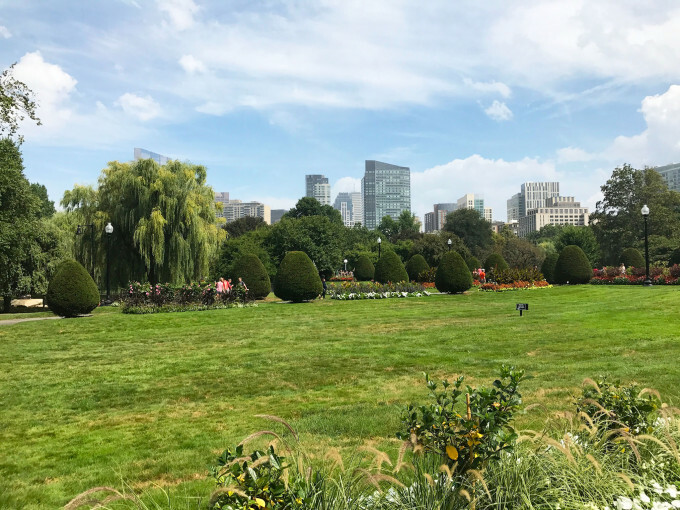 The counter protesters had moved on to a different part of the city, leaving a quite, beautiful public garden to experience. I’d go so far to say that I enjoyed the Boston Public Garden more than I’ve ever enjoyed Central Park. That may be blasphemous but visit for yourself and let me know if you agree! Following the Boston Public Garden, we headed to Boston’s North End to visit Paul Revere’s House. In all honesty, this was the most disappointing place we visited. That’s not to say it’s disappointing, it just doesn’t hold up to the rest of Boston’s offerings. Four rooms total make up Paul Revere’s House. Each room has informational plaques that explain that while many of the decorations used for the recreation of his home are typical of the period, many are not which I found odd. While I enjoyed the overall experience, I’d recommend using your time more strategically and exploring other parts of the North End, like the Printing Office of Edes & Gill and Captain Jack’s Historic Chocolate Shop! Two little shops situated right next to each other make up two charming historical experiences. The Printing Office of Edes & Gill offers a unique interaction with colonial printing. They recreate the printing process with a live demonstration of the printing of the Boston copy of the Declaration of Independence. Two steps over in the next room is Captain Jack’s Historic Chocolate Shop. A live demonstration is done for visitors showing how chocolate was made and consumed during the American colonial period. Chocolate today is completely different than during the colonial period. Spices like cinnamon and red pepper flakes were used and no sugar was ever added unless you were wealthy. It was also not eaten, but consumed as a beverage since the way chocolate was produced made it too hard to eat. The traditional chocolate candy bar wasn’t introduced until many years later. After a quick dinner at Quincy Market, we boarded a trolley for the Ghosts and Gravestones ghost tour. Having done many ghost tours in different cities, I had a basic idea of what to expect but this tour was by far my favorite ghost tour I’ve ever done. The staff were phenomenal and the stories were great. I was fascinated to learn that between 20,000 to 40,000 people are buried under the Boston Common. Makes our walk through the park earlier that day a little creepy to think about. I would absolutely recommend always doing a ghost tour if it’s available in the city you’re traveling too but most certainly the Ghosts and Gravestones Tour in Boston. Rounding out our long, full day in Boston, we stopped at the Tap Room bar for a few beers. The Tap Room only offers local beers from the New England area, no corporate beers such as Budweiser or Heineken. We each had a local beer, a Pineapple Jalapeno Cider for my boyfriend and an Unfiltered Tap Cider for myself (truthfully, I’ve always preferred unfiltered beer). We also split a light beer flight. If you’re looking to avoid the bars that turn into clubs and have a calmer, more pleasant bar experience in Boston, I’d recommend checking out The Tap Room! First thing Sunday morning, we headed to the Boston Tea Party Museum. I love history, I always have. I especially love American History. One of my favorite things about Boston is how they communicate history to visitors. It is so fun and interactive. Not once did I ever lose focus or zone out. I was constantly enthralled, not ever realizing I was learning. Each visitor of the Tea Party Museum receives a character card with information about your part in the Boston Tea Party. The ships have fake tea chests that visitors are able to throw over the boat. Each visitor even receives a feather to “disguise” their identity. A very well done experience from start to finish. After participating in the modern day Boston Tea Party, we made our way over to the Mary Baker Eddy Library which contains my favorite attraction in all of Boston, the Mapparium. A lover of travel and maps, this exhibit is one of the coolest attractions I have ever experienced. You walk into what is essentially the inside of a giant globe but with the writing on the map inverted so visitors inside can read it. The map is from the 1930s meaning old countries and borders are displayed such as the Soviet Union and Yugoslavia. The acoustics in the room are truly impressive. If one person stands on one side and whispers, a visitor standing on the opposite end of the room can hear the whisper. If you stand in the dead center of the room and speak, the room has a surround sound effect. Unfortunately, no pictures are allowed as the library is very strict about their trademark of the Mapparium but it is truly something any visitor to Boston should experience. Following a quick lunch we headed to our final stop on our weekend trip, Harvard. Now, I’ve seen movies and TV shows depicting the magic of Harvard so I had high expectations. Personally I have toured over 40 colleges and universities campuses and even worked for two colleges as an Admissions Counselor. The bar was set very high. Harvard, I have to say, you didn’t hit the bar. Harvard’s campus is massive and beautiful, but so are many other colleges across the United States. The university sits in the middle of the city streets and I was surprised to find them littered with homeless people. It was quite the juxtaposition. That being said, I still bought the sweatshirt. When in Boston? What are your favorite Boston spots? Let me know below!